Seabourn Quest is on its way! We have some fantastic news to share! Seabourn Quest departed the CiMar facility in Porto Nogaro, under tow to Genoa where she is expected to arrive on 20 August 2010. CiMar was first created for this project and has grown along with the Seabourn fleet. The company designated an area of about 50,000 square meters – formerly a potato field – and built a special overhead crane for the construction of the Seabourn vessels. 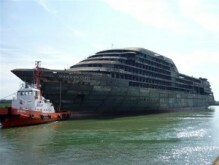 Odyssey’s hull was built there first and then the superstructure was added at Genoa. Sojourn was mostly built at CiMar including the superstructure, and Quest’s all steel work was done there. We are all very excited about Quest — stay tuned for more updates and photos!